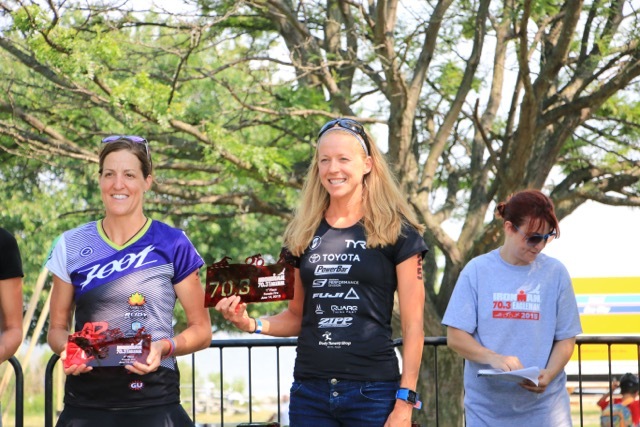 This past Sunday, I competed in my first ever Eagleman 70.3 Triathlon. 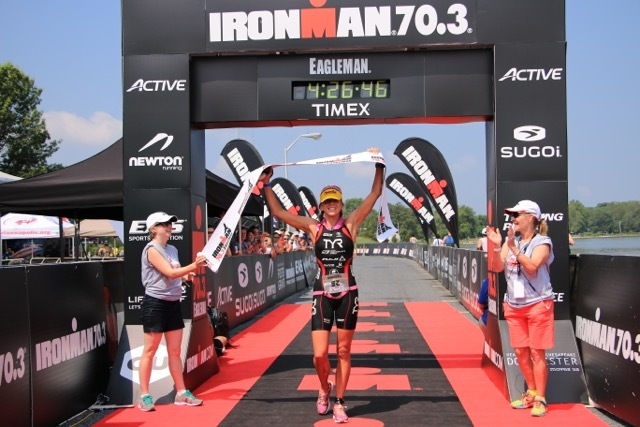 This was my second 70.3 of my career and happy to cross the finish with a win and more experience in the distance. The race took place in historic Cambridge, Maryland and has a rich history with the race taking place there since 1980. Race morning the alarm went off at 4:30am! Nate and I packed the car with everything the night before as we where staying 25min outside of Cambridge in the Town of Easton! For breakfast I ate one and a half peanut butter, honey, and banana sandwiches on the way to the race site and had 30oz of Powerbar Perform with extra electrolytes added as it was going to be hot and very humid out! Nate has been having me preload with different types of salts and it seems to help training and racing in the heat! At the race site the wind was surprisingly calm, but the heat quickly picked up and the humid atmosphere made it apparent that it was going to be a hot day! The swim was non wetsuit with warm, 78 degree water temperature. 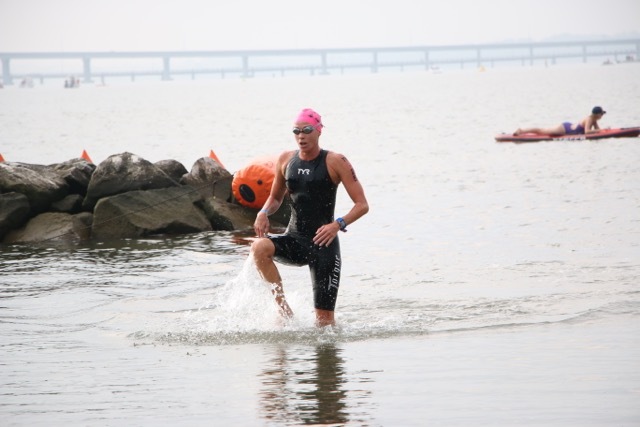 I started off the swim with a strong start and was able to stick with Lauren Brandon up until about half way when I lost her feet around a turn buoy. I exited the water about 30 seconds behind Lauren. 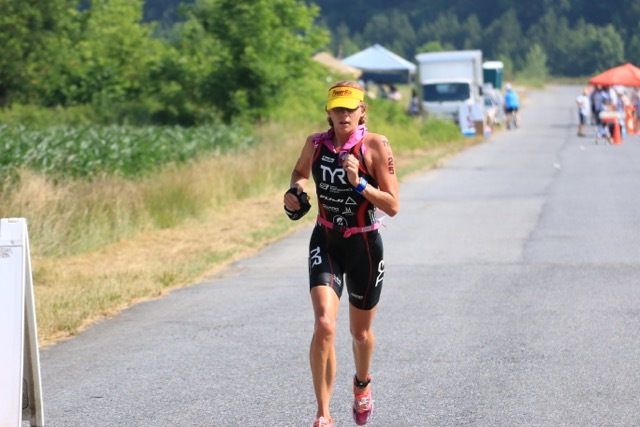 Once on the bike, I worked slightly harder than my normal pace to make up the ground lost I lost on the swim. At 15 miles, I moved into the front position and settled into my pace. 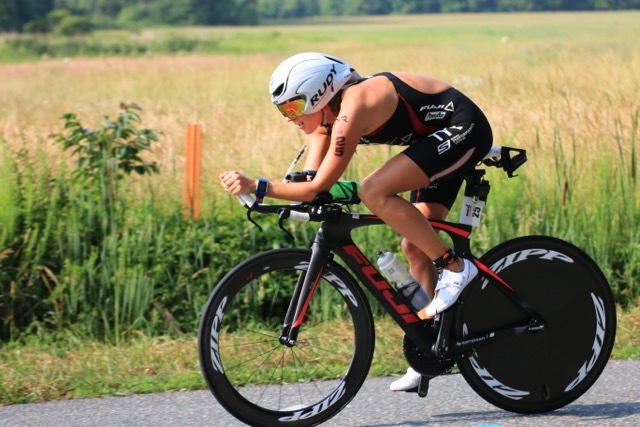 Here is my Quarq Power file presented by Training peaks! At the third aid station, I struggled to get a bottle in my hands the first couple of tries, but was able to grab one at the end. When I went ahead to squeeze water out of the water bottle I picked up into my aerobottle, the top sprayed water mostly out of my bottle, not in my bottle! Unfortunately, this left me without fluids the last 11 miles, but I hydrated very well the first half of the bike, so I was not too worried heading into the run. The course was beautiful for cycling! The roads were smooth, flat and fast and although the roads were open to traffic, I saw just a few cars over the entire course. With about five miles to go in the bike portion, I did get stuck behind a tractor! This was a huge tractor taking up the entire lane of road. The age group cyclists were riding in the opposite lane at three or four across the road. Fortunately, after what seemed like 20 seconds or so, I was able to get around the tractor. 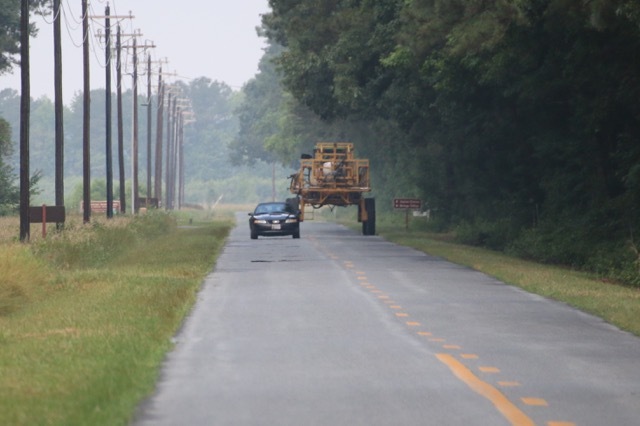 Cars may not be an issue, but watch out for farm equipment! I exited the bike about 35 seconds ahead of Lauren and ready to start the run! Without having fluids the last thirty minutes of the bike, I stayed very cautious at the beginning on the run and watched my HR with my Polar v800 I wanted to keep my HR under 160. I know from training if it goes much higher than I am in trouble! Here is My polar v800 file! . Right after I exited transition, I drank several cups of water and made sure I slowed every couple of miles at the aid stations to get a good drink of water each stop along with my Powerbar PowerGels. At the turn around, I was feeling pretty good with my effort and form. Several miles after I thought to myself I was feeling pretty good; however, that feeling quickly turned. Around nine to ten miles, I started to really hurt. My longest run since my injury was nine miles, so I was really feeling muscular fatigue the last 5k. During the run, I was glad to stay hydrated, finish with a win and gain fitness! The last few miles of the run, so many age group athletes were cheering me on as they were starting their run. It’s awesome to be in a sport where others are so supportive, even while racing! Next up is the Philadelphia Triathlon. This will be my first Olympic distance non draft this year, so it will feel a little different ramping up the intensity. I will take the next few days very easy, recover, and then have a short training block prior to my next race. Nate and I had a great time at Eagleman, enjoyed catching up with friends, and saw a new part of the country. Thanks everyone for the support!